Sie haben eine Frage zum Mila Motel 2? Das Mila Motel 2 befindet sich an idealer Lage (die Gegend Pantai Cenang ist lokal sehr beliebt) und eignet sich sowohl für Geschäftsreisende als auch Urlauber. Von hier holen Sie das Beste aus Ihrem Aufenthalt und aus dieser lebhaften Stadt heraus. Ein weiterer Pluspunkt der Unterkunft ist ihre Nähe zu den zahllosen Attraktionen und Sehenswürdigkeiten der Stadt, wie Mc Donald's, Underwater World Langkawi, Your Language Books Corner und einige mehr. Das Mila Motel 2 hat sich mit seinem herausragenden Service und einer breiten Palette an Einrichtungen dazu verpflichtet, Ihnen den Aufenthalt so komfortabel wie möglich zu machen. Zu den Top-Einrichtungen der Unterkunft gehören: Gratis-WLAN im Zimmer, öffentliches WLAN, Parkmöglichkeiten, Familienzimmer, dedizierter Raucherbereich. Das Ambiente des Mila Motel 2 spiegelt sich in jedem Gästezimmer wieder. Flachbild-TV, WLAN, WLAN (kostenlos), Klimaanlage, Schreibtisch sind dabei nur einige der Einrichtungen, die Ihnen zur Verfügung stehen. Egal ob Sie ein Fitness-Liebhaber sind oder nach einem langen Tag einfach nur abschalten wollen: Die erstklassigen Freizeiteinrichtungen wie Garten usw. werden Ihnen gefallen. Im Mila Motel 2 genießen Sie nicht nur unvergleichlichen Service, sondern logieren gleichzeitig auch noch an einer renommierten Adresse. Einzig die große Entfernung zum Cenang/Tengah Beach war störend, da man jedes mal 10-15 Minuten an einer Straße ohne Gehsteig entlang laufen musste. Dafür war das Zimmer sehr schön, groß und das Personal sehr nett und hilfsbereit und alles in sehr ruhiger Lage. Wen der Weg zum Strand nicht stört (Tip: Roller gibts günstig zu mieten), dem kann ich das Motel nur empfehlen. Wir haben uns wohl gefühlt und guten Gegenwert fürs Geld gekriegt. I used iron but the iron less hot even the temperature was on maximum. Please provide better iron. Toilet is nice and perfect but lack of air circulation as the toilet became so hot and lil bit smelly (because of air) when you enter. You did provide the small air fan circulation but i guess you may provide small window for better air circulation. Overall, i satisfied but you can improve for better hospitality. I recommended your place. Thank you! With the price, I think it's very worth it. 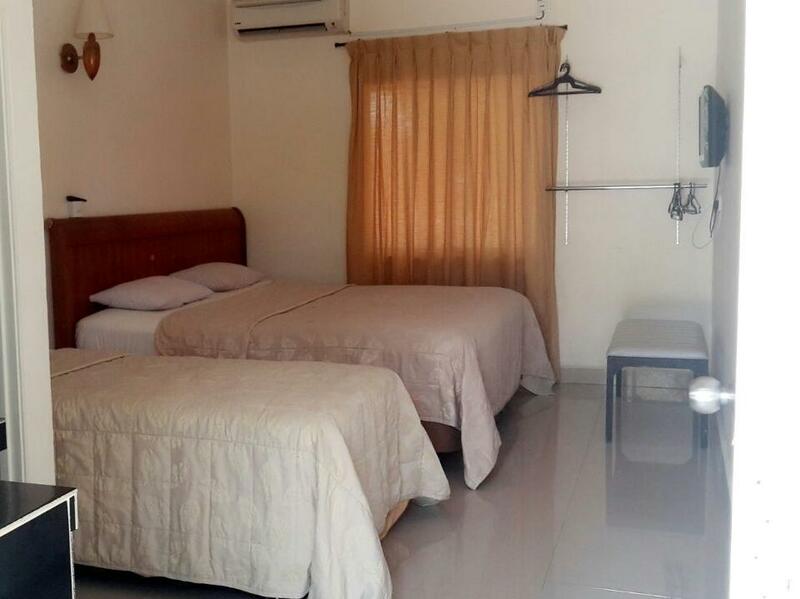 Big room with basic amenities. I mean bed and clean toilet are the basics. They provide Coway water dispenser at the reception so no worries about drinking water. Friendly staff but the staff was not always present at the compund. Just that I had to do 3 u-turns until I found this place. The signboard was way to tiny! The only thing they need to upgrade is the size of their signboard. And maybe a mini fridge too? The room was too hot due to the exposure to the sun. The roof was made of metal so the heat easily transfers into the room. The aircon does not help much as it took 2 hours to cool down. On the other hand, the staff was friendly and willing to offer help. I previously followed the location entitled "Mila Motel/Hotel" in Google Maps, turned out the location was wrong, you should follow the point named Mila Motel 2. The man who attended the front office was defensive when I told him about the wrong dot. Unlike other major hotels in Pantai Cenang area, the location is not at the beach strip, you have to walk more to reach the beach or take a taxi. The most unsatisfying things was the dirty floor. I can feel grains of sand under my feet when I walk barefoot in the room. The other facilities are sufficient, all I needed was a room, a bed, and a shower. Although, it would be better if there is any tea or kettle in the room. It located near Pantai Cenang and Pantai Tengah. Since Pantai Cenang is one-way, we need to turn a big round to back to Pantai Cenang. The short-cut road was building, it would be great after the road done. The signboard of the Mila Motel was so small, easy to miss it either daytime or nighttime. U got what u pay for. too many bugs, especially at night. The air cond remote control was not functioning and make us freezing at night time. The toilet light was very dark. Good location, unfortunately pantai cenang had been 1 way road, need to take other road.